The following interview was conducted between Roleplayers Chronicle Editor-in-Chief Aaron T. Huss, denoted by the prefix RPC, and freelancer/writer Jennifer Brozek, denoted by the prefix JB. The interview was conducted via Skype messenger on Monday, March 18. RPC: Welcome to another Word in Edgewise interview from Roleplayers Chronicle. Today we are talking with JB of freelance writing fame. Jenn why don’t you start by introducing yourself and giving everyone a look at your writing credentials. RPC: From that bio, I’m guessing you do a lot of fiction writing in addition to role-playing games? JB: I do. I have more than 50 short stories published, 2 non-fiction books, 1 collection, and I’m the author of the Karen Wilson Chronicles. The first book, CALLER UNKNOWN, was out last year and the next book, CHILDREN OF ANU is due out in May 2013. RPC: Give us a quick rundown of what Karen Wilson Chronicles is please. JB: Sure. The Karen Wilson Chronicles is my love letter to the supernatural pacific northwest. It was originally a webseries on the Edge of Propinquity. Now, each year is a mosaic novel edited by John Helfers. Each novel chronicles one year in Karen Wilson’s life in 13 short stories that have an overall arc to the year. It is the kind of creepy urban fantasy that could be happening around you when you walk out your door and you’d never know it. The fourth novel was never published. So, that will be all new to the Karen Wilson fans. RPC: Would you say you have a knack for fantasy horror/urban fantasy and the like? JB: I do have a knack for the creepy, yes. And I do primarily stick to horror and urban fantasy. Though, with Shadowrun and Battletech in the mix, I can’t say that I never do sci-fi. RPC: If you had a preference of genre, or at least one you lean to most, would it be fantasy, historical, or sci-fi… another option is just mash them as much as you can? JB: You know, I used to say it was urban fantasy with a liberal dash of horror. But these days, I’m writing weird west and stompy robots. So, I guess the only thing I can say I do consistently is write some genre mixed with horror. However, to this date, I haven’t written romance. RPC: I think you should interject some romance into a Shadowrun book… I am like you and love mash-up genres where you get to add a little flavor from everywhere you want to create something truly unique. With that said, do you find it easier to write about unique settings or ones that are already defined (such as historical or ones with a lot of their own canon already developed)? JB: You know, there are benefits and drawbacks to writing in both your own setting or someone else’s IP. When it is someone else’s world, they’ve worked out all the rules and it can be very easy to write within those constraints. On the other hand, sometimes it is really awesome to make your own world with your own rules, factions, and conflicts. So, both have their pros and cons. RPC: To date, in regards to the RPG books you’ve written, have you only worked under define constraints or were you allowed to go crazy and create something completely unique that comes straight from your mind? JB: I’ve been let off the leash in a couple. For Colonial Gothic, I’ve been allowed to make up a bunch of location settings with everything I want in them–within the rules of the game and the contraints of history. For Battletech, I’ve written a web series for Battlecorps.net called The Nellus Academy Incident. I was able to put the story on a planet called Nestor that, to date, had only one line of description written about it in 27 years of IP. That was so cool. I got to make up everything else within the constraints of the Battletech universe in 3063. 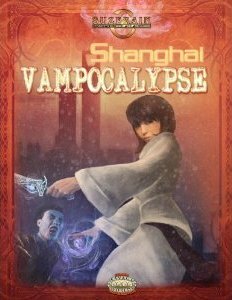 Another one I’ve gotten to run off the rails is Shanghai Vampocalypse. I was give the briefest of outlines for what the book was supposed to be about and everything else was up to me. That was so much fun. RPC: We will definitely get to Shanghai Vampocalypse and Colonial Gothic, but before we do, I’d like to ask a handful of general questions. When did you first start writing professionally? JB: I started being paid for writing in 2001. I wrote RPG book reviews for Black Gate Magazine and Campaign Magazine. In 2004 I started writing for games, beginning with Dragonlance’s Holy Order of Stars and Legends of the Twins. RPC: When you look at all the books you’ve authored and co-authored since 2004, which one are you most proud of? JB: Under RPGs, Shanghai Vampocalypse, Proverbial Monsters (White Wolf), and The Nellus Academy Incident are up there in the top. Under fiction, I’m pretty darned pleased with INDUSTRY TALK and CHILDREN OF ANU. RPC: What is The Nellus Academy Incident? JB: The Nellus Academy Incident is a YA Battletech webseries on www.battlecorps.net that tells the story of a PR event with 8 Nellus Academy cadets that goes horribly-horribly wrong. 14 of the 25 episodes have been published. I wanted to tell the story of what its like to be a military dependent but not actually in the military. There is a completely different culture for military brats. They have to grow up fast. And it’s a hard life in the Battletech universe. RPC: Given that you’re a freelance writer, when is your favorite time to write? JB: Most of the time, I write from 12noon and on. I usually stop when my husband comes home and we spend time together. However, if I’m stuck on something or under a deadline, I will start writing again as late as 10pm and keep going. RPC: Given your vast RPG bibliography, I’m assuming you must be a fan of playing RPGs. Do you get a chance to play anything you write? JB: I’ve never played anything I’ve written. I’ve run some stuff I’ve written. That doesn’t mean that I don’t play in the worlds I’ve written in. I’m in a couple of weekly games that rotate through different games. My current favorites are Shadowrun and some version of D&D / Pathfinder. But I won’t say no to a Star Wars game or a 7th Sea game. RPC: I guess it can be hard to be a player in a world you helped develop… making GM’ing being that much easier. I’d like to talk about Colonial Gothic. What type of interest do you have in history? Is it a schooling interest, a personal interest, or one that you find exciting to write about? JB: It’s a personal interest. When I walked by the Rogue Games booth at GenCon back in … 2007 (I think), I just had to stop. The idea of ‘horror in 1776’ as an RPG really appealed to me. There’s so much about real life and history that you can hang mysteries, the supernatural, and secret societies on that it was just too rich to pass up. RPC: Colonial Gothic is one of my favorite settings, and I love the incorporation of fantasy and horror into an actual historical environment. How much research into the history of that period did you do for the four locations you’ve written about? JB: I have never done so much work for an RPG. For each one of the settings, I’ve done everything from gotten history books from the library to called the historical societies for the cities involved. Colonial Gothic is the most research intensive RPG I’ve ever had to work on. RPC: As a reference, when did you write Elizabethtown? JB: 2009. I wrote Elizabethtown first because I used to live on the east coast near Hagerstown, MD. Originally, the setting was called Hagerstown. Then I discovered, through research, its original name and where it came from. RPC: As a reviewer, writer, and editor, I find that my writing in just the past 3 years has changed quite significantly through the use of good editors. When I read through Colonial Gothic: Locations, you can definitely see a progress in your writing style from the first Elizabethtown entry to say the Savannah entry. From a personal and professional standpoint, would you say your writing has significantly matured from your first Colonial Gothic work? JB: Are you kidding? I’m tons better now. Writing is one of those skills that gets better with age and experience. I don’t care who you are. You will almost always cringe when you go back and look at what you did a couple years before. I really have gotten better and that’s because of the company I keep. I strive to be as good as the authors I know. It’s not easy but it is a good goal to strive for. RPC: Do you think your work as an author having other people edit your work or your work as an editor cleaning up other people’s work has influenced that the most? JB: Hmm. I think it’s a combination. Reading slush made me realize I wasn’t as bad or as good as I thought I was. It taught me a lot about writing and making it interesting for the reader. Editing has given me a leg up because when I step back and put my editor hat on to edit my own work, I know what to look for and what some of my consistent flaws are. Being edited by amazing editors like John Helfers or Jean Rabe make me sit back and examine why they made the changes they did. I don’t think one thing is better than the other. But I do think every author ought to be a slush reader at least once in their life. RPC: Did you choose Savannah and Charlotte Haven or were those locations already defined as the ones to write about? JB: I chose them. I was asked to look to the southern states for a couple of the settings. I did a little bit of research to see which ones would be good for the RPG and I chose those because of the history I found there. RPC: If you’re allowed to divulge this, do you have more Locations writing in the hopper for Colonial Gothic? JB: I do. And I can. 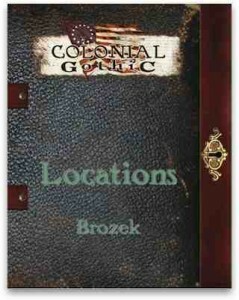 The next book is called Colonial Gothic: Lost Colonies. It deals with only two lost colonies but the set-up is different. The first colony I write about is Popham. It was a colony established in 1607 that died in 1608. In the book, I have a linked plotline where you can play one set of characters in the 1607 era, and then another set of characters in the 1776 era. You can play either side in any order you want. And is it the most horrific of the location settings I’ve written. I won’t tell you what the other lost colony is. RPC: Ooh, that sounds cool! Let’s move on to Shanghai Vampocalypse. Can you provide a brief overview of what the Shanghai Vampocalypse setting is? RPC: Is it a plot point setting? JB: It is. 12 plot points. 12 hours. However, there are 18 side quests broken up into three 3 linked sets of 6. Through the magic of the game and stuff I can’t tell you about, these side quests take no time on the main timeline. RPC: Before you said you were given a lot of freedom on Shanghai Vampocalypse. How much of the setting was defined before you started writing? JB: Mostly how the monsters were created and the year the story is set in. Pretty much, I got to do everything else. I did my own outline, got it approved and then went to work from there. Though… Alan Bundock did all the stats. All I had to do was write the world. He had to make crunchy bit sense of what I wrote. Fortunately, he was really good at that. RPC: When you look at the setting as a whole, as in the actual flavor, look and feel of the setting, was it presented to you for writing or did you present it to Savage Mojo? For instance, did they ask for a cyberpunk vampire action horror setting or were they a lot more generic on what they were looking for? JB: Martin set the tone for me. We talked about Hong Kong action theater mixing with cyberpunk horror. He told me that that was what he was going for in the book. Fortunately, we were on the same page. I knew from the get-go that it was a crossed genre of cyberpunk and wuxia. Think wire work kung fu with 2048 technology both conflicting and adapting to each other. RPC: Knowing Savage Mojo is essentially a collection of freelancers, are you a part of their freelancer team or did they turn to the general industry for someone able to write this setting? RPC: Seeing Millennium Knights on your bibliography, do you have additional Suzerain work lined up with Savage Mojo? JB: Millennium Knights is the last thing I did for Savage Mojo. Right now, I don’t have anything else on tap for them. RPC: Does that mean no follow-up Shanghai Vampocalypse supplements? Or just none yet that you’ve been asked about? JB: None yet that I’ve been asked about. RPC: As we wrap up this interview, let’s move away from freelance work and talk a little bit about your own work. What is Apocalypse Ink Productions? JB: Apocalypse Ink Productions is a small press that focuses on dark speculative fiction on one side and writing in the internet age on the other side. We will be a year old in April. RPC: Congratulations on your impending anniversary! I see the Karen Wilson Chronicles are being published through this imprint. How many writers are part of your team? JB: Right now, we have a series by Ivan Ewert – the Gentlemen Ghouls series, a non-fiction book by Jay Lake, and my series, the Karen Wilson Chronicles. We have plans to add an ebook novella line soon. But as the contracts aren’t signed, I can’t give specifics. RPC: What do you mean by “writing in the Internet age?” Are you referring to eBooks? Or a web series? JB: I’m refering to writing with the internet as a main tool. In INDUSTRY TALK, I took two of my published columns about freelance writing and anthologies and put it into one book to talk about the behind the scenes practices. How the internet affects business and such. Jay Lake’s PROCESS OF WRITING is based on 7 years of blog posts around the process of writing from a personal blogging point of view. Which means we get a lot more personal thoughts about it and how the internet affects writers today. RPC: Well Jenn, that’s all I have for this interview. Would you like to take a quick moment to plug any of your current or upcoming publications?